There is a terrific golf course in McHenry County, often overlooked by Chicago area golfers, that offers spectacular topography and scenery unlike what is usually found in McHenry County and northern Illinois. Upon making a first visit to this golfing gem, golfers may think to themselves ‘Gee, Toto, this doesn’t look like Illinois’. Just follow the yellow brick road, in this instance, Route IL-176 to Prairie Grove, IL and drive into the parking lot of Prairie Isle Golf Club. Climbing out of the car and glancing at the surroundings, golfers may wonder ‘what state am I in?’. Initially it could be the state of confusion or the state of wonderment, but after completion of the 18-hole routing golfers will more likely feel a state of euphoria or a state of contentment. The Prairie Isle website describes their own course as having a little bit of everything: woodlands, wetlands, and meadows; a second description by management also calls it both a thinker’s course and a shotmaker’s course. Both statements have nailed the course summary precisely. Golfers who wish to travel the entire length and width of the state of Alabama and play the Robert Trent Jones golf trail can experienced four separate and unique settings at the four major sites– the valley in Huntsville, the mountains of Birmingham, the lake at Auburn/Opelika, and the swamps of Mobile. Or, simply stay closer to home and experience ‘a mini-RTJ trail’ that is all rolled up into the acreage at Prairie Isle. 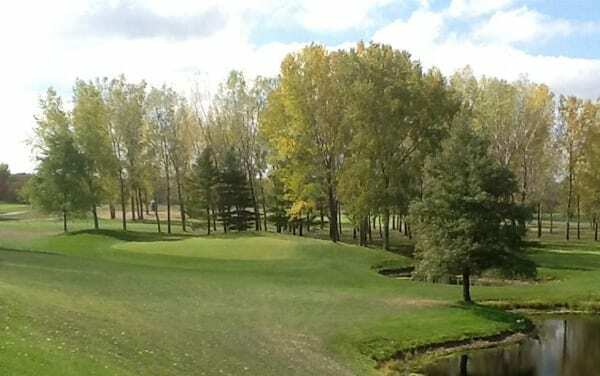 Prairie Isle Golf Club plays to a balanced par of 72 (36-36), with a standard number of two par-3’s, five par-4’s, and two par-5’s on each nine. Three sets of tees set the distances at blue (6601 yards / 71.8 / 131), white (6255 yards / 70.2 / 127), and red (5438 yards / 71.4 / 125), which are simultaneously very challenging yet very playable. Designed by Gordon Cunningham, his routing menu is a flavorful series of changing topographical features that carries on for a few holes then switches to other scenic challenges. Golfers who have warmed up sufficiently, or who are natural quick starters, will have scoring opportunities on the first two holes; #1 is a shortish par-5, and #2 is a short par-4, both holes feature gently rolling or downhill fairways. The next four holes move golfers into a more wooded section of the course, the highlight of which is hole #4, a scenic, short and tight, dogleg par-4, fronted by a pond. Arrival at the #8 tee means that golfers are now perched on the ‘mountain top’ tee of the signature hole; below is a generous sized green, however it is almost entirely surrounded by water. A long par-4, #9 hole, brings the golfers back to the clubhouse and a chance to catch their breath before facing the hazardous beauty of the next four holes. Reminiscent of courses in our Southern states, the wetlands on holes #10 and #11 will catch the attention and errant shots of golfers on these two challenging holes. An abrupt change of scenery will now have golfers believing that they’ve arrived in New York state’s Adirondack or Catskill Mountains, as holes #12 and #13 are tree-lined passageways over deep valleys; two long, straight drives are required for this pair. The final-five holes are a handful of beauties that will make or break the round. #15 is a second signature hole, another peninsula-like, par-3, with rocks sprouting from the water close to the green. Golfers looking to gain a stroke on par will be fooled by the easy handicap rating of ’18’ on the par-3, #17 hole; it’s harder than it looks. Hole #18 is a final fooler; the yardage deems it to be a short par-5 (blue, 505 yards; white, 497 yards). The first 80% of the hole plays staightaway, but then makes a sharp turn to the right and is uphill to an elevated green; additionally, the fairway slopes to the left. Birdies or better are possible, but so are ‘others’; par is good, and satisfying on #18. Don’t forget to click the heels of your Foot Joys three times and say “there’s no place like Prairie Isle…there’s no place like Prairie Isle…there’s no place like Prairie Isle”.